Posted on 09/28/2015 in Game Recaps. 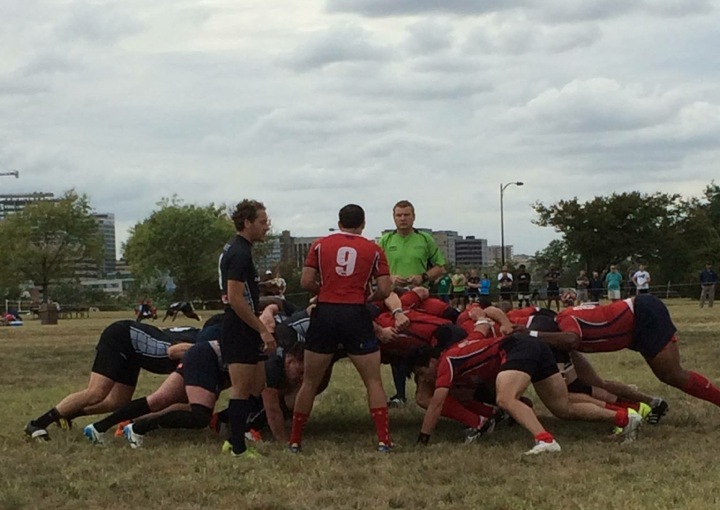 The Potomac Exiles’ D1 and D3 sides each shrugged off slow starts to move to 2-0 on their respective seasons. The D1 side traveled down to NOVA, while the D3 team headed north to Aberdeen to take on North Bay. The Potomac Exiles dominated possession for the first ten minutes before an intercepted pass led to the first points of the game and an early 7-0 lead. Potomac shook it off with tries from loosies Jovilisi Fotofili, followed by Kevin Kimble for his first Exiles’ try. Scrum half Matt Quigley hit the conversions as Potomac jumped on top 14-7 and seemed to settle into their game plan. However, more sloppy play would lead to another soft NOVA try and the teams headed into the halftime break knotted up 14-all. Potomac’s athletic forwards proved too much for NOVA in the second half. Kimble and lock Rob Newcombe combined for 5 tries, each player contributing long and punishing runs throughout the day. Potomac regained control of the match with a 29-14 lead, but NOVA would scrap back to 29-21 with 14 minutes to play. However, Kimble’s second try, followed by his old college buddy Chris Saint’s at 78′ would seal the 41-21 victory. Recognition from the North Bay side led to an early 7-0 deficit. The home team took advantage of Potomac’s aggressive line out defense, lobbing the ball over the top to a waiting 8 man, who took the ball on the fly and dotted down the game’s first points. Potomac rebounded quickly with a strong run from flanker Cesar Diaz for his first Exiles’ try. With the score knotted up at 7, President Minchik took a “hammer” ball, barreled over some defenders and put Potomac on top. Fly half J’Son Townes hit his second conversion to give the visitors a 14-7 lead heading into halftime. Townes hit a penalty at 48′ and followed that up with a try and conversion for the 24-7 lead. North Bay battled back with a penalty kick of their own, followed by a long try from the winger after a handling error to bring the margin to just seven points. At 70 minutes, Townes weaved through a number of would-be tacklers to put Potomac back in command. North Bay fought through to the end, scoring at 77′ for the game’s final score, 31-24.